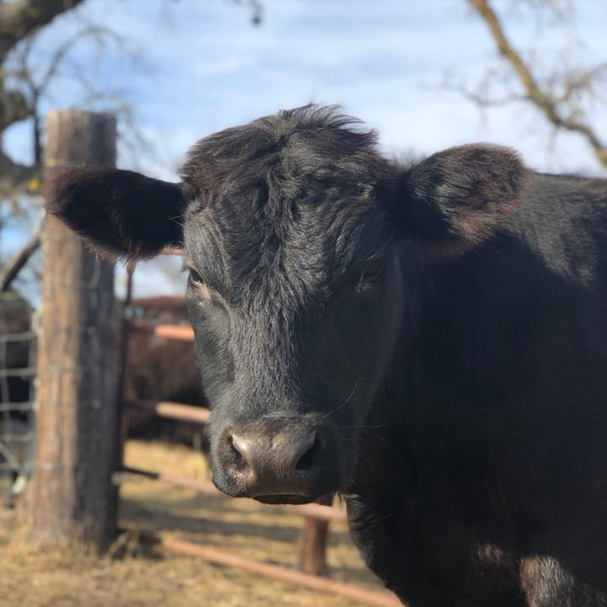 Kip is our second rescued calf. He came to us after a farmer's daughter pleaded with her father to allow him to come to ifs. His mom remains a feed lot cow and we are sure misses Kip every day. Kip was so small when we got him, he rode home in the back seat of a pick up truck. He lived in part of the house for the first couple weeks so we could monitor his health as he has a breathing issue which which was diagnosed as a mass on his airway. Kip was then the recipient of the first surgery of its kind on a cow! He is now very happy and healthy and spends most his time with the other Angus steer, The Liber8ed.